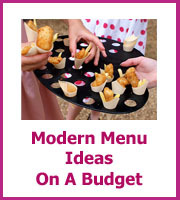 Cheap wedding menu ideas can often be a bit scarey, it's not often that you are catering for the kind of numbers that will be at your wedding and no one wants their guests to leave early looking for something to eat! You want your wedding food to be yummy and easy, you need menu ideas that will let the conversation flow and that is just right. You have probably already started to look at the wedding menus that local caterers have and they can often be very inflexible, plus fairly pricey. If you do want to have a caterer then you need to be creative with the type of wedding reception you have; a champagne and cake reception, cocktails and canapes, a brunch, and an afternoon tea are all great reception menu ideas. 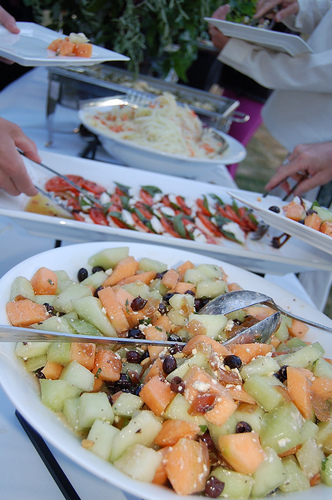 The big savings come when you cater for your wedding yourselves, but that doesn't mean the two of you up all night cooking and then serving your guests, there are bound to be lots of people that will be happy to help. Chicken dishes will be the cheapest meat option on set wedding menus and are the most popular choice at every venue I have worked at. Cold meat platters and salads - if you are catering your wedding you can pick up platters quite cheaply at places like Costco. The best one has to be to use your wedding cake as your dessert. Another option is to have a dessert and candy table for your guests, which doubles as your favors too. One of the easiest and cheapest ways is to have a potluck reception and the best bit is that they are becoming more and more popular and they are the true traditional wedding reception. To get the idea to your guests it is a good to mention it to a few of the key family members, you know the ones that like to be involved! Then pop a little note in with your wedding invitations saying that you are having a traditional wedding celebration and rather than a wedding gift you would love it if they could bring a dish to share, ask them to get to let you know what they are able to bring and then that way you will be able to bulk out the food by buying extras. Make your wedding reception a retro chic celebration. 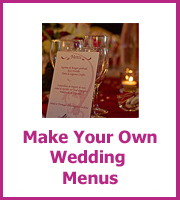 For those of you who want to provide the food here are some great wedding menu ideas for all of the seasons. Summer is the most popular time to get married and with a better guarantee on the weather it is not surprising. Summer brings memories of picnics and trips to the beach, so a great start would be a picnic wedding celebration. Salads, bread rolls, cold meats and cheeses, summer fruits and don' t forget the wedding cake! Serve sparkling wine, fruit juices and if you can have someone bring some flasks for tea. Get everyone to bring a blanket or buy them cheap in your wedding colors and then have paper plates and paper napkins on a picnic table with all of your yummy food. Barbeques are also a great relaxed summer wedding reception, everyone knows that the men have to take control when it comes to the cooking of the meats so you already have your chefs in place. Meat is expensive so bulk up your barbeque with burgers and also vegetable kebabs. Have salads, relishes and rolls as well. Ice creams in a cone add a touch of fun and your wedding cake will also be a good dessert. For a more formal summer menu then look at a salad starter, followed by seafood or a chicken dish and then summer fruit desserts. 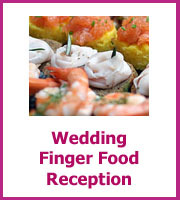 If you need to have everything ready before the reception then it would be better to have cold chicken or a poached salmon. 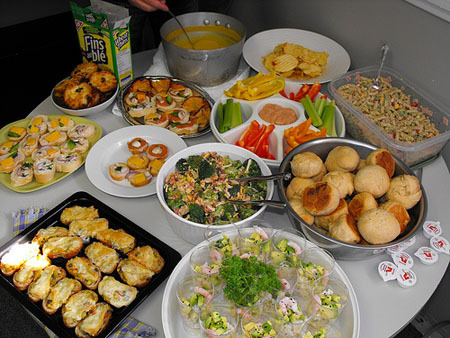 Even easier might be a buffet where you won't need anyone to plate up the dishes, a downside is that you have no control on how much food each guest takes, so it would be a good idea to have someone serving the main dish - the salmon or chicken and then let your guests help themselves to the salads. Spring is the time for fresh new vegetables and what better and easier way to show these off than by making a beautiful in season vegetable soup, you could serve these with big chunks of crusty bread and with a dessert that could be all your guests will need. If you feel you would like to serve more food then lamb and chicken with fresh herbs would be prefect. Meat is expensive so look at buying cheaper cuts of meat and slow cooking them with onions, herbs and tomatoes. Dishes like Greek Lamb Kleftico or slow cooked lemon chicken are delicious and you could have then cooking for a few hours before. Serve with roasted vegetables and couscous. Spring desserts could be lemon meringue pie and light fruity puddings. 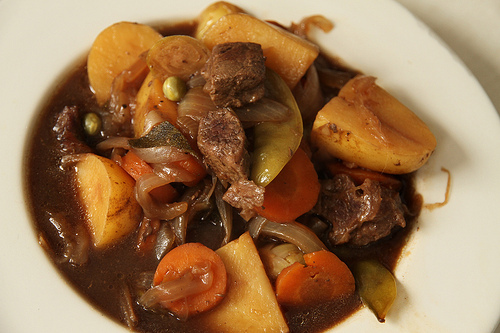 Fall and winter are the seasons that you want warm, comfort food, casseroles and stews are great for this and although they don't sound glamorous enough for a wedding remember it is all in the description! And retro foods are the fashion food in these economic times, just do them with a twist! Green bean casserole, Ham and Sweet Potato Casserole, Mixed Bean Casserole (a cheap filling dish even if you don't have lots of vegetarians) or Venison and red wine casserole if you can afford to push the budget slightly (Venison can be cheaper than Beef). Have a look at the foods that would be in season for when you are getting married. 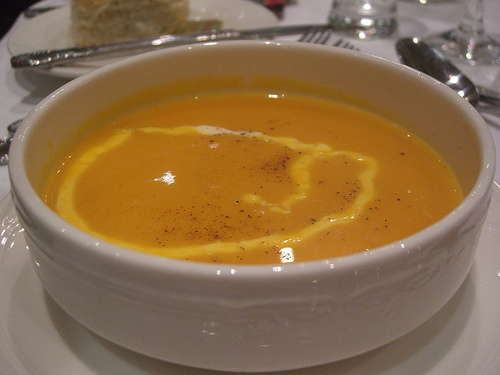 The soup and crusty bread menu from the Spring menu ideas would also work well for winter, add some spices for an extra warm glow. Warming hot desserts would be a perfect end to your cosy winter wedding!